Turkish Self-Taught in Latin characters. By the Natural Method with the Phrases. Specially prepared and written. Usual light blue printed wrappers. A very nice bright copy. Clean and tight. 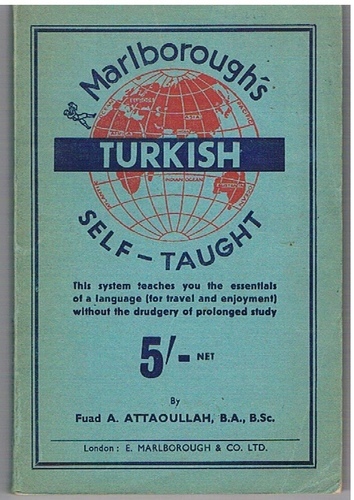 ; This system teaches you the essentials of a language (for travel and enjoyment) without the drudgery of prolonged study. Roman script, phonetics, vocabularies, phrases arranged by subject, tables of weights and measures, coinage, postal rates and telegrams.